Lead Generation is the process of getting the contact information of potential customers. These leads are added to a conversion funnel of a business. If everything goes as planned, they become paying customers. For example, this can be an fly-fishing amateur leaving an email on a fishing store’s website to get a special discount on their products. The basic idea may seem simple, but there are many factors that you need to consider if you want to see your leads convert into customers. Choosing which lead generation strategies you should follow will affect the channels you need to consider and the means you want to use to contact potential customers. By the end of this post, you will know not only how to reach people that are genuinely interested in your products or services, but also how to encourage them by offering value. And I can promise that these lead generation strategies won’t ruin your marketing budget! A lead is someone interested in what you have to offer. Leads are placed somewhere in the middle of a conversion channel. They are a step further than visitors who simply entered your website and are just browsing. They are also a step before a qualified lead – someone who signaled that they want to buy something by putting something into cart or by signing up for a trial of your service. 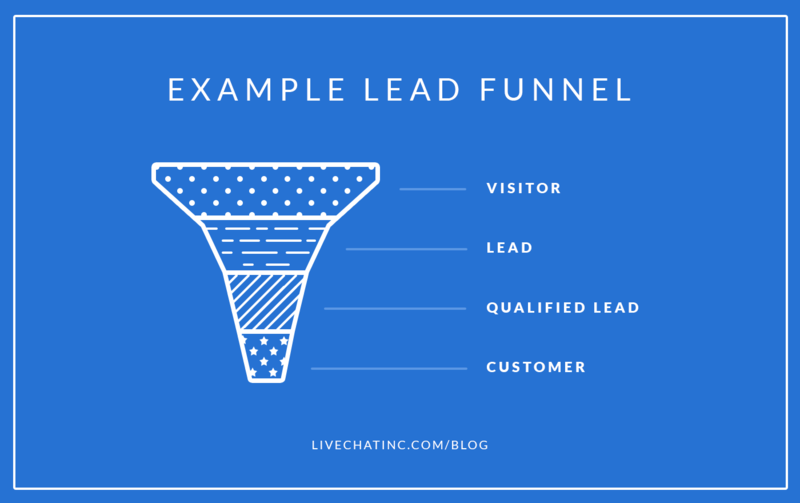 Here’s how the sales funnel looks like with visitors, leads and qualified leads. Lead generation strategies help you convert ordinary visitors into leads by getting their contact details. When we talk about lead generation strategies, we obviously don’t mean willing these potential customers into existence. Instead, lead generation is about reaching those potential customers and asking them to tell you a bit more about themselves. Online lead generation strategies chiefly deal with getting a potential customer’s email to get the opportunity to contact them with a pitch later on. First/last name – makes the contact with a potential customer seem more personal and less automated. Phone number – used to contact leads once they’ve gone through an email marketing campaign (more on that later); usually useful for your sales team. Company – B2B companies can also ask which company the person represents to get to know the lead better. Apart from what the lead tells you themselves, you should also be aware what made them do it. For example, if you were to give a fishing equipment company your email to get a free copy of an book on fly fishing, they should take note, remember your fishing preferences and suggest you either other materials on that type of fishing or recommend you some fly-fishing equipment. Since you already know what a lead is, we should talk about catching or capturing it. All lead generation strategies include a step where the lead is captured, you get the information about the potential customer. This usually happens on a landing page where the potential customer fills out a form with their personal information like the previously mentioned name, email or phone number. You might be wondering why would anyone surrender their personal information to you and I don’t blame you. In this day and age, leaving your email address or other contact details usually ends with a never-ending torrent of spam in your inbox and a series of unwanted calls from sales people. This is why you need to provide some kind of incentive to the potential customer. If you offer something in return, something that the potential customer really values, the idea of giving out their email is no longer that crazy. This can be that ebook on fly fishing the customer really wants to read. This also can be a video tutorial, a limited time offer or simply a discount coupon for your store. If you’d like to see some good examples of good landing pages that offer content in exchange for your contact information you should head to HubSpot’s website. They’ve become really, really good at creating content that’s valuable for their audience. 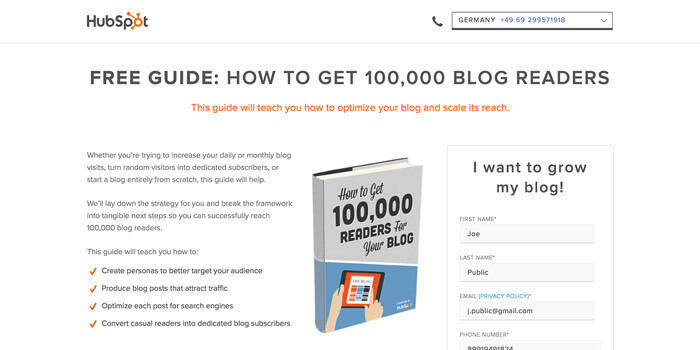 The landing page for HubSpot’s How to get 100,000 Blog Readers Guide is a textbook example of how you can grab leads. But don’t take my word for it. 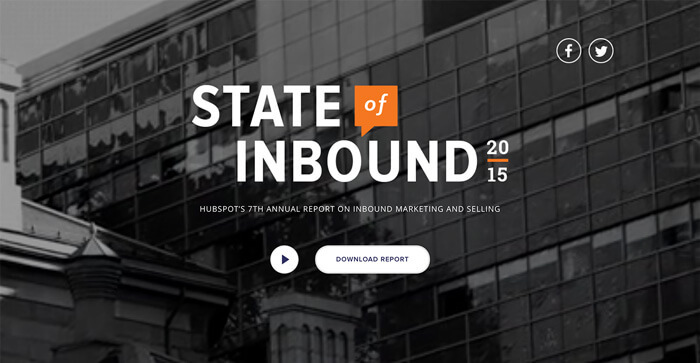 Check out the landing page for their State of Inbound Report 2015. It has everything a good landing page should have: clear description, supporting graphics and videos, crisp value proposition and a form. And even though the form’s a bit long, I bet people don’t really mind because they want to get their hands on all that inbound marketing data as soon as possible. HubSpot’s State of Inbound Report 2015 shows us that even longer forms can be a part of a successful lead generation strategies. It’s all about making it worthwhile for your customers. And the best way to do that is through content creation. Now, before we talk more about the ways you can create incentives for customers through content creation, we should touch on the topic of simply buying the leads. There are many services that offer you a large database of contacts that can be filtered for your needs. 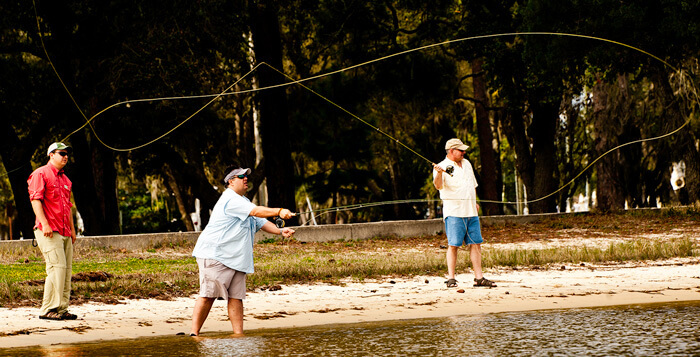 For example, you could try reaching anyone who’s interested in fishing. At a certain price, you get an immediate access to a large group of potential buyers. What’s the downside though? Well, I can spot a couple. First of all, any lead generation strategies that involve buying leads will always cost you more than capturing the leads yourself. The quality of the leads is also different. Although you usually can narrow your search a bit, the leads won’t be specifically interested in your business but in a product or service type in general. The leads you capture on your website already have some kind of interest in your business so you start in a better position immediately. Eli Gladden, someone who sells leads himself, argues that you can generate more valuable leads internally. He obviously doesn’t say to stop buying leads altogether. Instead, he suggests that there are several advantages when buying leads yourself. Finally, these leads are not exclusive to you. Any other business can target the same sector and get the same list of leads as you did. Depending on how competitive your market is, you may be facing dozens of rival businesses courting for the same customer. Just imagine what would happen if five different fishing equipment stores started fighting for the same customers. They would start undercutting each other, spamming the leads with their offers. This would quickly get frustrating for all involved parties and nobody would win. As far as the lead generation strategies go, buying leads can be a good way to kick-start your lead generation but you shouldn’t overly rely on them. It can serve as a nice filler for the sectors you can’t reach with your organic results. The basic idea behind lead generation strategies is that you have to first offer something to get the contact information in return. And we’re talking something really valuable here. Something like useful content. Creating content related to your industry gives you a couple of perks. First of all, it drives traffic to your website. The more and the better content on a particular topic you have, the higher you will rank for keywords related to that topic. Secondly, you build up your brand’s identity. Each piece of useful content created by your company shows potential customers that you really know your stuff. And finally, by creating content you get something potential customers want. That’s your bargaining chip. You can use it to get their contact details to approach them later on. Each piece of content you create needs to have a certain value. Otherwise nobody will want to share their email with you. To add that value to your content, you can offer solutions to problems your potential customers face. For example, you could prepare a video tutorial on various methods people can use to create bait. Anyone who’s struggling with that would be happy to leave you their email in exchange for the knowledge. They could reach the landing page through a link on your website, a post on social media or a targeted CPC campaign. It’s a win-win situation because the potential customer gets a piece of useful content and you get a way to contact them in the future. Offering targeted content like this will help you capture many valuable leads. These are not random people who simply stumbled on your website but your actual customer base. And the best part about it? You’ve just taught them something about their business or hobby. Guess who will they turn to the next time when looking for more advice. We recently used this method when promoting our new Customer Service Report (if you’re interested in customer service trends, you should definitely check it out). 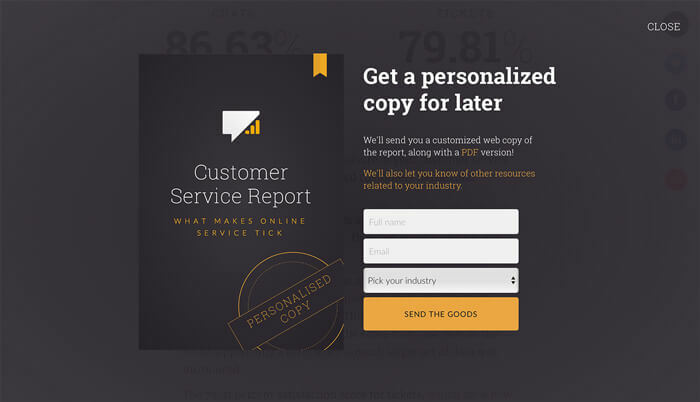 Using a simple pop-up with a form, we asked the report readers if anyone would like to receive a customized version of the report in which all the information about their industry would be highlighted. They simply had to provide their name, email and industry. A simple pop-up like that generated over 400 leads to this day. This gave us 400 more chances to offer some valuable knowledge and build up our brand image in the future. Even though everyone seems to hate them, a pop-up form can generate a lot of leads. Live chat can be a surprising but very efficient way of generating leads. To use this source, you simply need to ask the visitors for their email before each chat. Most companies do this by default and often get loads of leads unknowingly. After all, most people who are not your customers yet and chat with you have some kind of interest in your company. Even after filtering the few ‘mistake’ chats, you still get a hefty amount of potential leads. Even if you don’t manage to close a sale during a chat, the email a customer left when signing in gives you an in. In LiveChat, we contact all our sales leads that shown some interest during chat but didn’t make a decision to start a trial. In those emails, we simply let them know that they can ask any questions they still might have and our Key Account Managers will get them sorted. Here’s an email we use to follow up with our sales leads. They get around 49 percent open rate and 21 percent reply rate, which are pretty good results for these types of emails. A similar campaign targeted at paid leads got only 1 percent reply rate (another reason to prioritize internal lead generation). Additionally, certain integrations with services like Active Campaign or Mailchimp will allow you to capture leads and add them to a mailing list immediately from the chat window. The visitor needs to simply check an email opt-in box when signing in to chat. When discussing lead generation strategies, it would be hard to pass on the topic of making a follow up and marketing automation. By following up, you can eventually capitalize on the previously captured lead. Going back to the fly-fishing example, somebody who downloaded the ebook or the video tutorial may want to get some new equipment to test out these methods. And that’s the time when the fishing equipment company that produced the ebook and the video should send the person a special offer on their equipment, preferably on the items mentioned in the ebook/video. This is of course just an example and you should usually offer a few additional materials to build trust between the lead and your company. If they liked the material on fly fishing, maybe they would be interested in other types of fishing as well? This is where marketing automation comes into play. Marketing automation allows you to automate some of the actions involved in converting leads. Contacting each and every customer manually would be exceedingly hard and would cost you in the long run. However, you can use tools like Marketo, Autopilot or HubSpot to create a string of automated paths your leads can follow. From the time a lead is captured, it enters a specific route or journey as they are called in Autopilot. They then receive a number of emails based on their current place on that route. For example, a business usually opens with sending the piece of content the leads signed up for. The path doesn’t end right there though. After a set amount of time, they can receive another piece of content, one that’s somehow connected to the previous one. You can also send these emails based on various conditions, for example you can check if the lead read your previous email. Businesses can crate loads of journeys like this to automate most of their email campaigns. Marketing automation is the natural next step if you are implementing various lead generation strategies on your website. After all, these leads won’t convert themselves and all they need is a little push. Lead generation and conversion doesn’t have to cost you thousands of dollars, especially if you’re not planning on buying all those leads. By creating valuable content, capturing organic leads and following up, you can boost your sales without using the more expensive lead generation strategies that rely on a monthly pool of bought contacts. Here’s a quick summary of what you can do to get a lead generation strategy going and how to proceed once you do. If you want to capture a lead, you first have to give something valuable. This is why you need to invest in making useful content related to your business. Your website will not only start ranking higher, but people won’t mind giving you their contact details just to get your latest report or tutorial. Buying leads has definitely some upsides to it but it will cost you. It can give a nice kick to your marketing operations and is probably the fastest way to get leads but you should focus on organic lead generation first. It’s also nice if the competition doesn’t have access to the same leads as you. If you end up wanting that kind of kick, check out lead generation companies like Growbots or RightHello. Your landing pages don’t have to be the only places where you try to get some customer information. Even though everybody apparently hates them, pop-ups are a really great way to capture leads. If you are using live chat, or any other customer service platform, you already have loads of potential leads waiting for a contact. If you are not using live chat yet, get a free 30 day trial of LiveChat and see how many leads you can get. When making the first follow up after capturing a lead you don’t have to immediately send someone a catalogue with your best offers. It’s much better if you are providing something of value to the customer with every follow up. Give them more and more valuable content and the eventual sales pitch will come off naturally, as they will probably want to try out all the products and services you’ve been telling them about in your content. If you’re unsure how to get the ball rolling, here’s what we think makes a successful follow up. At some point, staying in touch with all the leads you capture will become impossible to do by hand. Using marketing automation, you will be able to contact hundreds of leads while making sure that they convert into customers. We can definitely recommend Autopilot. It has done wonders for our email automation and lead nurturing. Other tools you can check out is HubSpot, Marketo, Act-on. There are definitely other lead generation strategies that don’t cost marketers an arm and a leg to get going. If you know of or use any other, please share them in the comments! Cover photo courtesy of Samuel King Jr via Creative Commons.